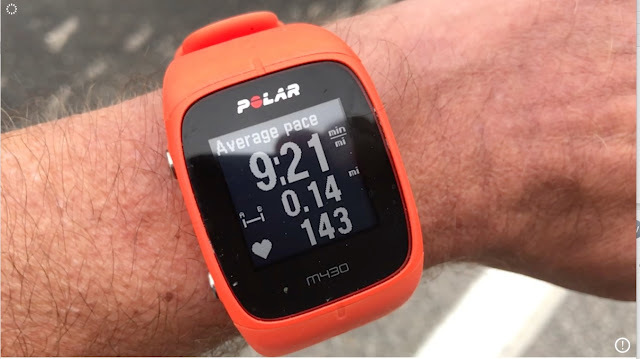 The Polar M430 is a great value in a run, focused modern styled GPS watch with optical wrist heart rate. 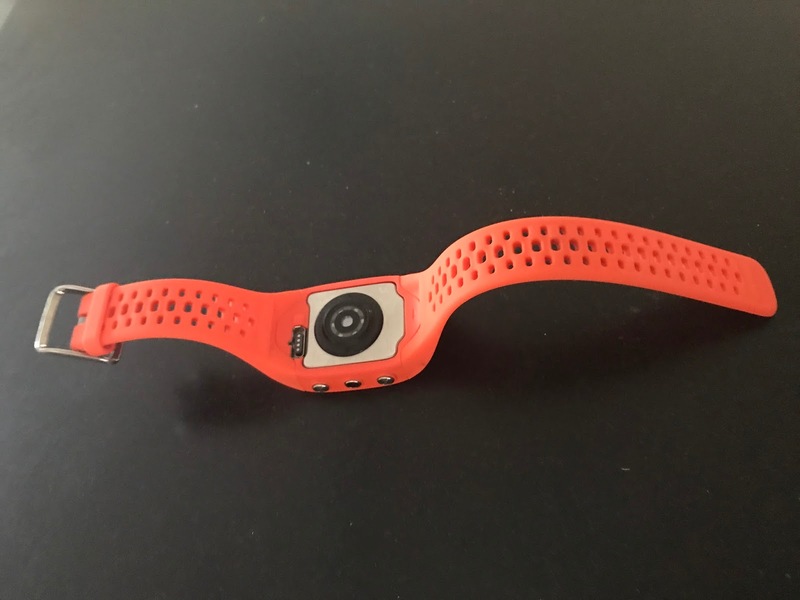 It focuses on running with a full suite of free training options, great screen visibility, accurate and reliable heart rate in our testing and a super comfortable soft fit on even smaller wrists. While not having every "smart GPS watch" bell and whistle on board the combination of hardware and back end app and web site is a strong challenge to Garmin in mid range watches. The Polar Flow app and web site training platform is truly outstanding, ever improving and extremely well integrated to the watch. Purchasing a watch is not just about the wrist hardware, they basically all do a good job with GPS tracking these days, so we also attempt to present some of the highlights of the Polar Flow back end below. Unlike some of its competitors, the M430 does not try to be an overly "smart watch" and does not have features such as music control, 24/7 continuous heart rate monitoring and a fancy color screen. 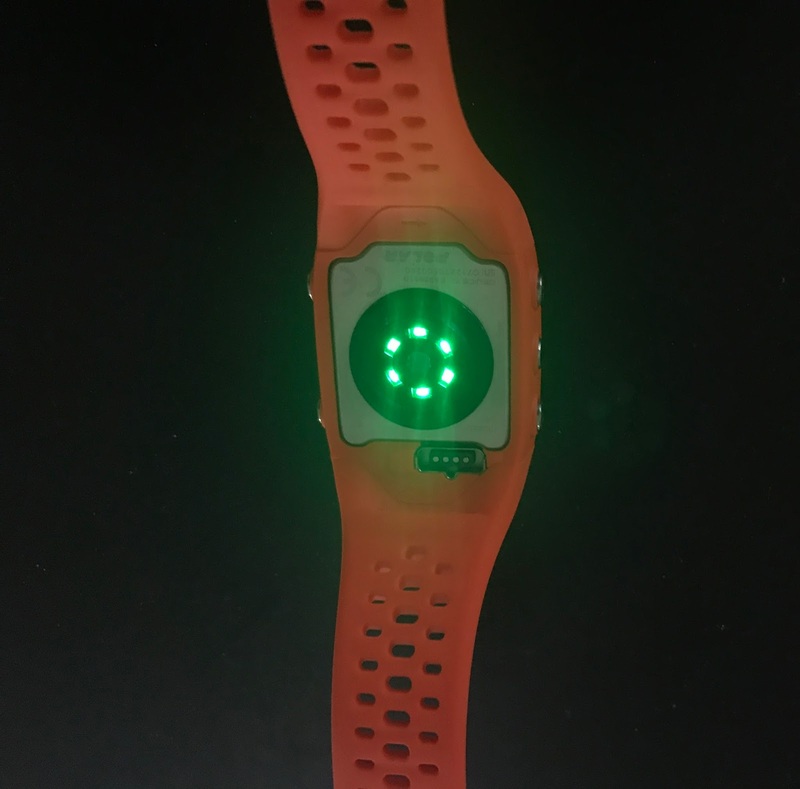 It does track steps and has a basic movement based sleep tracker. Battery life is strong enough at 8 hours in Best GPS plus heart rate 1 sec sampling, 12 hours in Good GPS and heart rate 1 sec low power mode, and can be extended to 30 hours with 1 minute GPS sampling. The Garmin Forerunner 35 and Vivoactive HR with which it directly competes have a 13 hour full activity mode but lack the 30 hours ultra focused lower sampling rate mode. The M430 is rated at 30 meter water resistance so is fine for all swimming. The screen is the same 128 x128 resolution monochrome as Polar's high end V800 and has been visible in our testing in all light conditions. We recommend keeping data fields to 3 per screen as it does not have the biggest screen out there. Polar, unlike any other optical wrist heart rate watch we have seen to date, has 6 LED lights instead of the usual 2 or 3 to illuminate blood flow for the sensor. We have a thin (15.5 cm/6.1 inch) non dominant left wrist and in our testing to date, on our tricky for accuracy left wrist, the M430 had been the most reliable in terms of avoiding high spikes early in a run of any wrist monitor we have tested to date. High heart rate spikes, most often seen early in runs in cold weather, can be caused by the sensing confusing cadence impacts with blood flow, particularly in colder weather when blood flow to the extremities is lower. If you are right handed and have accuracy issues with your left (most wear a watch on the left wrist) non dominant wrist, shift it to the other wrist. Wearing gloves and sleeves when you start a run if it is cold will also help lock in early accuracy. There is more than just an excellent sensor and LED light array and the algorithms to interpret in play with the M430. The watch, case, and band were carefully designed to wrap the wrist snuggly when cinched with the stretchy soft and thin strap not being uncomfortable. A tight seal keeps out light and air which can interrupt readings. In our interview with Tom Fowler CEO of Polar USA he emphasized that great care was used in the industrial design, algorithms to interpret, and sensor array to achieve the comfort and accuracy. After our testing we agree! There are clearly different approaches to the case and band design. The black top of the line Garmin Forerunner 935 with wrist heart rate (top below, RTR review here) sits flat on the wrist. While it weighs yet less than the M430's 52 grams at 49 grams, cinching it tight on my thin wrist is not as comfortable and doesn't quite produce as reliable wrist heart rate as the M430 wrist conforming band shape and band does. The white older M400 (bottom below) while essentially the same basic case and band design has a far less pliable and less stretchy strap. Of course it doesn't have wrist heart rate so didn't need to be as snug. The M430 is operated with 5 buttons. Synch to the app by holding down when in time mode. We like overt actions to synch. Bluetooth often being delayed in initiating automatic synchs. 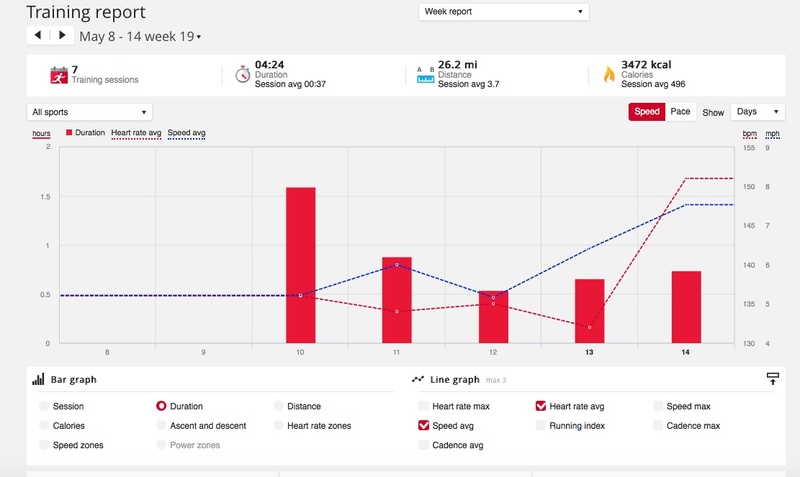 Center Red: starts workouts, marks laps and also is the selection button for screens in time mode. In workout mode you will scroll through the screens you have set up with the right side Top and Bottom buttons. By pressing and holding the red Start button on the run you can lock in your current in run heart rate, or pace zone, your zones being previously set up in the app. The watch will give you audio alerts if you stray from the zone. You can turn it off at any time by pressing and holding the button again. We prefer this approach to more static zone alerts which don't take into account various paces during a run. Dozens of Sport Profiles are pre loaded and many, may more are available to load via the app. They are very easily configured then synched via the excellent Polar Flow app or via USB cable to your computer. We pruned the list to show options selectable on our watch in the screen shot below. Each Sport Profile can be individually configured via Polar Flow. Dozens of metrics can be configured including, Polar being heart rate training specialists there heart rate metrics along with cadence, ascent, descent, and altitude derived from GPS. The M430 lacks the more precise barometric altimeter found in higher end watches and even low end bands and watches where flights of steps are counted. We wish the M430 included a barometric altimeter. These days behind every great watch we look for a strong back end data analysis and social platform as part of the package. Polar has an incredibly full featured training platform and a very basic social platform although sharing runs into a movie called Relive with Google Street Views is avaialble. Highly visual in both the app and web site Polar Flow is is as simple or as complex as you want to make it. I view it regularly and also easily and automatically export my Polar runs to Strava. Feed gives you a chronological view of your activities. It is identical in the app and in the web version. 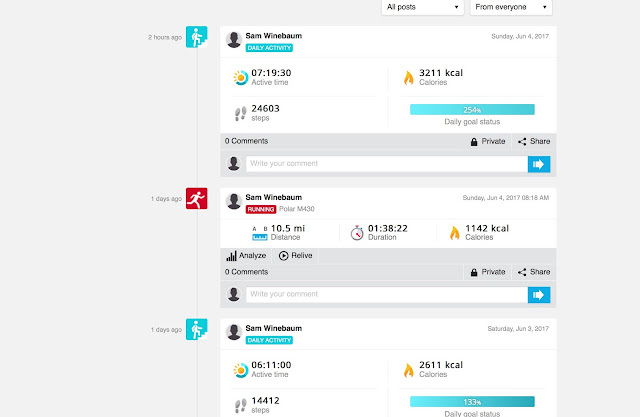 Clicking on an activity gives you the details. Note the color coding of the graphs for time in heart and pace rate zones. 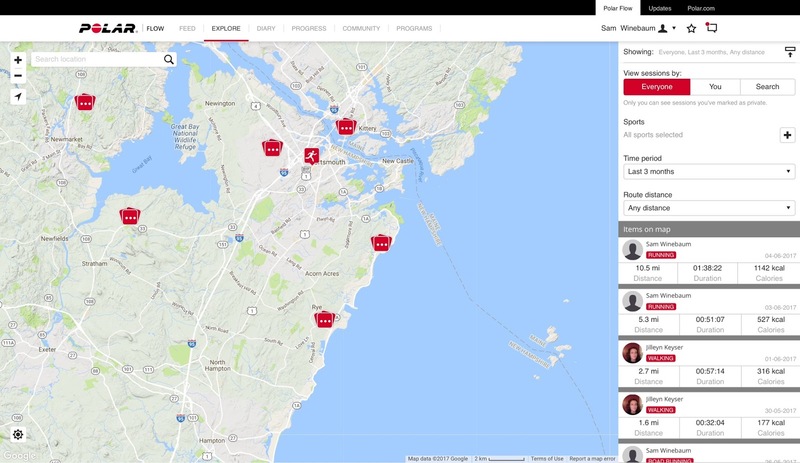 You can Relive your run complete with Google Street Views and all the metrics in an animated automatically created in the app or the web service. We wish the Street View auto selections were more "scenic" and you can't add your own pictures as Suunto's Movescount movies of activities allows. We could not find a way to share the Relive movie in the app. We were able to copy and share a link from the browser in the web service. Link to my Relive for the run above here (Chrome or IE only it seems). The app has a an activity "circle". We find it only marginally useful at a glance. 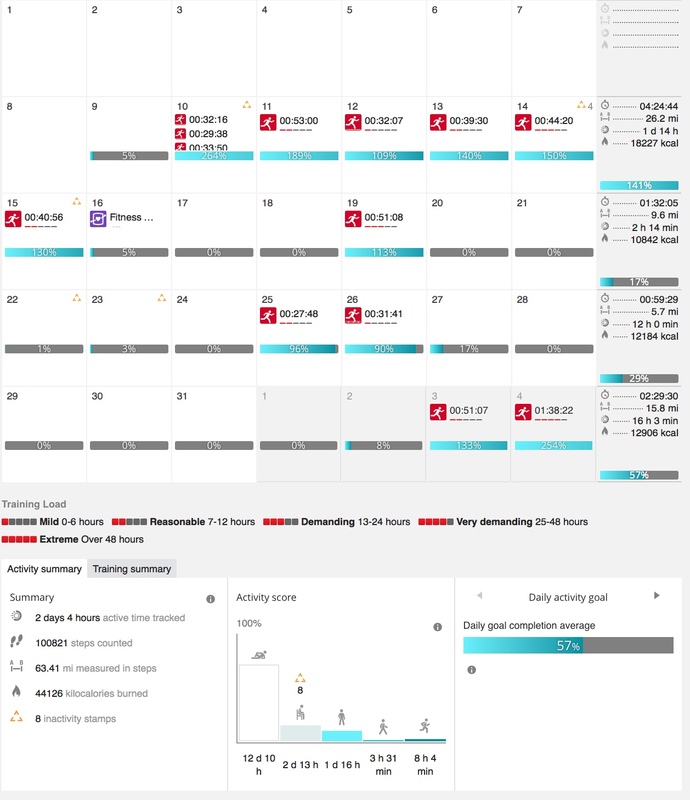 Diary shown only on the web site version shows a calendar view of each workout, its relative intensity illustrated with a bar graph, your high inactivity moments as yellow triangles, and your overall activity. Drill down on any day or activity. The M430 comes with a whole suite of what Polar calls Smart Coaching. It's all free. Fitness Test calculates your VO2 Max in a few minutes while lying still. We prefer approaches which estimate it on the go continuously such as Garmin's and Fitbit's. Running Program lets you select training programs for various race distances. I selected a fall marathon. 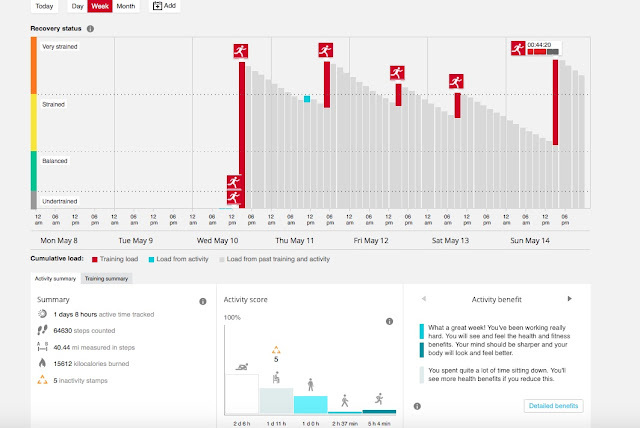 Polar Flow will load your program's future workouts to your watch where you will find them in the Diary section and also cleverly lined up for that day when you press the center right button where you select a sports profile and start a workout. The programs adapt as you train but we have not run long enough with them to evaluate this. 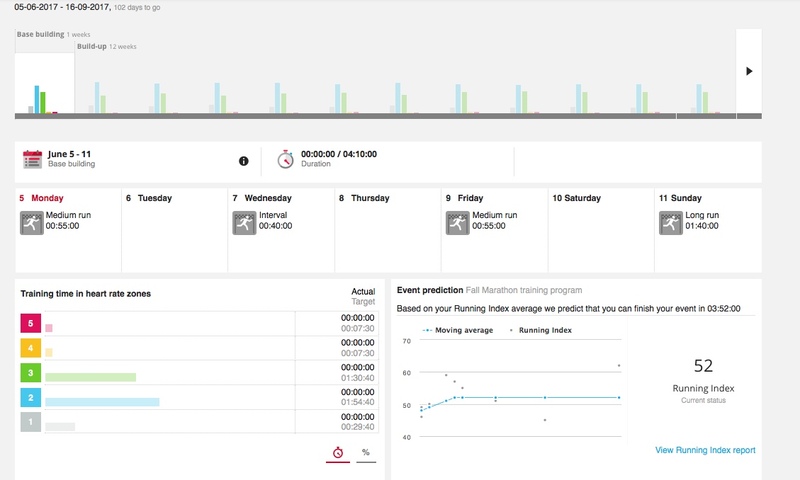 Over time Polar will evolve your race time prediction. It predicted a 3:52 for me, a BQ, and about right using the limited days of data I collected from the Polar Running Index. Polar says it pioneered this capability of providing an estimate of VO2 max via the Polar Running Index average. 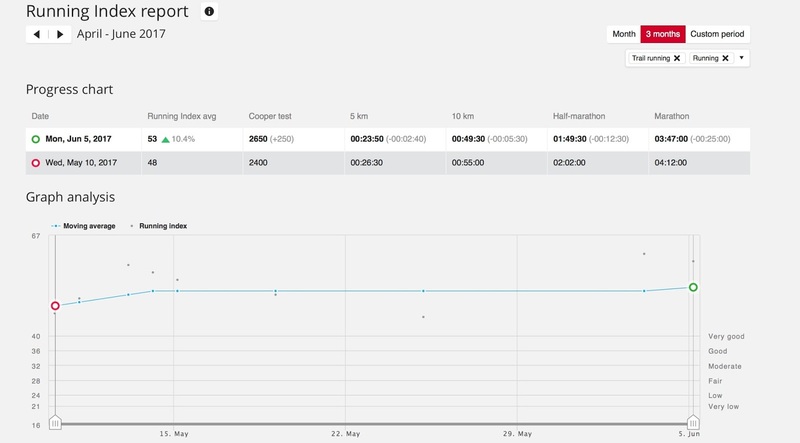 During a run, the Polar Running Index will automatically analyze your heart rate and how it performs relative to the speed and elevation and it will provide you with a score that accurately estimates your V02 max (assuming you have set your HR max and rest correctly). The Running Index predicted that marathon time of 3:52 but only a 1:50 half. I have already run 1:41 this spring, so clearly it was working off of limited days of data. Progress gives you high customizable graphic views of your training progress. 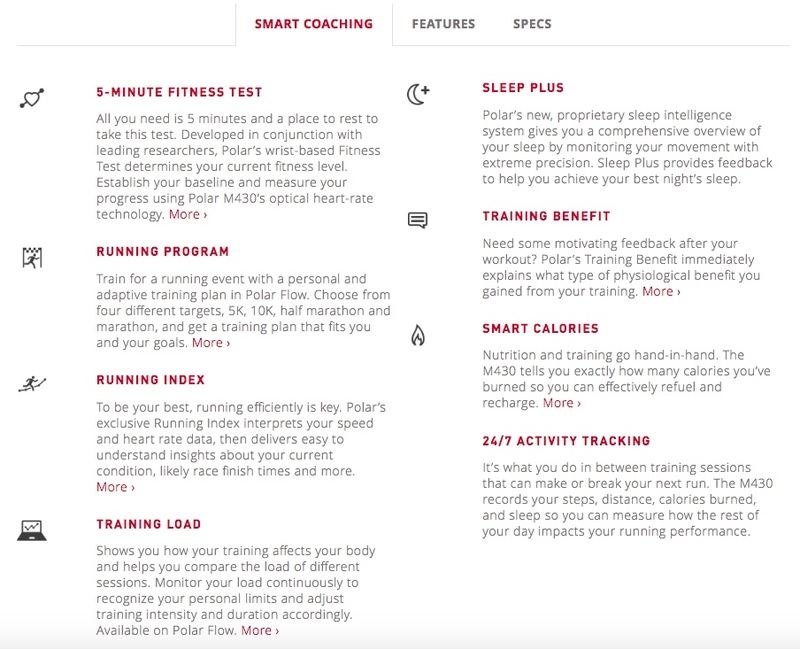 Polar treats intervals, race pace runs, duration and distance runs as Training Targets. Configure them and you can either set them as scheduled workouts to be found in the watch's Diary screen or as Favorites accessible anytime via the watch Favorites screens after synching. Intervals or phased targets in Polar speak can be configured via the app, the others need to be configured via the PolarFlow web site. The M430 used in conjunction with the Polar Flow app and website for the display and analysis has a basic sleep monitor. It is currently movement based and does not include heart rate data so it does not as of yet quantify the quality of sleep (Deep, REM, Light) as Fitbit and Whoop do. We expect a more sophisticated sleep calculation is in the plans. We found it over estimates actual sleep somewhat confusing sleep with time in bed. We like that the Recovery module focuses on cumulative activities and workouts. It does not as of yet take into account any 24/7 heart rate monitoring as part of the recovery as the M430 only measures heart rate during workouts and other activities. Explore only on the web site version lets you zoom in on any place in the world and see other Polar users activities and routes. Community let's you join groups focused on different sports and run distances. You will see a feed of most recent activities, worldwide, by members. You can comment on runs, post, etc.. The M430 is a simply outstanding GPS/HR watch at a great price. While it lacks every smart watch bell and whistle of comparable Garmin, including not having continuous 24/7 heart rate monitoring and is priced $30 more than the current prices of the older Forerunner 35 or Vivoactive HR, its focus on training is laser sharp and complete, the fit and heart rate accuracy is among the best, if not the best of any watch at any price, and the comprehensive and free tools on Polar Flow can, if you chose to use them, help you run smarter and faster than with any other free platform. The M430 was provided at no cost. The opinions herein are the author's. How does it compare to the Garmin 35 and 235? 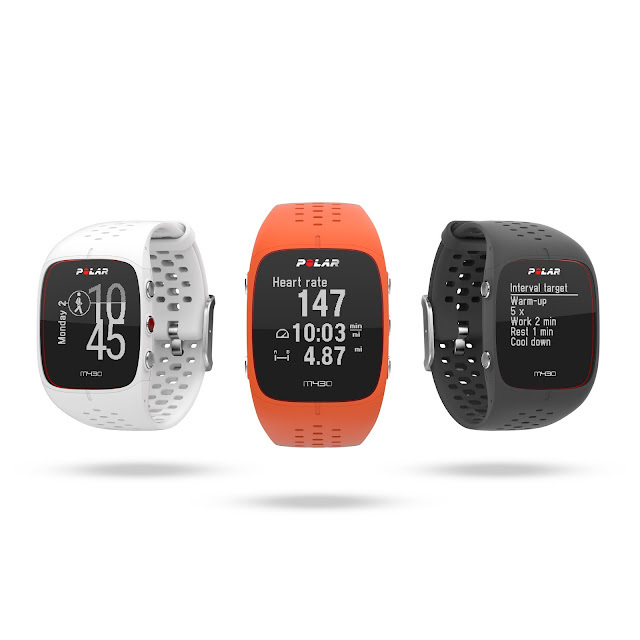 If you are using the M430 not only for training but also for activity tracking 24/7, you must know that the M430 activity percentages are not at all compatible with older Polar devices. You will reach 100 % with an M430 with about the same activity that an M400 will track as about 60-70 %. So you will reach your activity goals ridiculously easy with an M430. What's more, the displayed amounts of activity to reach 100% are completely nonsense on an M430. The M430 is a great sports watch to monitor training sessions with HRM/GPS. But when it comes to activity tracking, it's in my point of view a bummer! The new M430 at $230 sits between the current pricing for 235 of $280 and 35 of $200. Note that as 35 is now on sale at $200 I suspect a new model may be on the way. Battery life is lower for M430 in Best mode at 8 hours but in Good at a lower power mode, also 1sec sampling can go to 12 hours, one hour more than 235 and 35 spec. And M430 can at one minute sampling extend to 30 hours which I don't think either 35 and 235 offer. In terms of screens the 35 has an identical 128x128 monochrome display maybe a touch more legible than M430 due to the larger fatter digits but less ability to go to 4 data fields if I recall. The 235 has a 215 x 180 larger screen with some color. The 35 worked well on my small wrist for HR, the 235 less so, with M430 the most reliable due to its shape and overall sensing approach but the Garmin are fine. Really the only areas 24/7 are very useful is if you do many activities during the day beyond running to get at your overall cardiac intensity automatically without starting activities (M430) and for getting at sleep quality via combining HRV (Heart Rate Variability) and movement and Garmin does not yet analyze sleep that way. 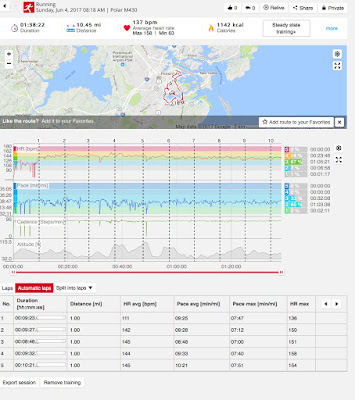 As far a platform for training, web site and app while Garmin is super data rich PolarFlow of me is far more usable and has deeper training features and deeper HR insights. Hope this helpful. Thanks for your comment. The activity tracking by the watch itself should not have changed much if at all. Polar may have changed how it looks achieving activity goals but not sure and will find out. I see in the Daily Activity Goal on your Settings that it asks you to pick one of 3 levels of intensity of your daily activities I picked High Intensity: jogging, running, other intense activities. I do agree I always go way over 100% but look at the score relatively speaking. So for example I took a day off from running yesterday, worked all day at my desk and was 23%, the day before I ran 5 miles at a light tempo and was 125%, the day before that 10 miles also light tempo and as I suffer from some allergies noticed my HR was higher for pace than expected that day so ended up 254%. Actually it does have Smart Notifications. It displays every notification from phone and alerts when someone calls. nice and detailed review. lots of supporting imagery. love it. I was wondering after more than a month now what views you have on the M430's accuracy? 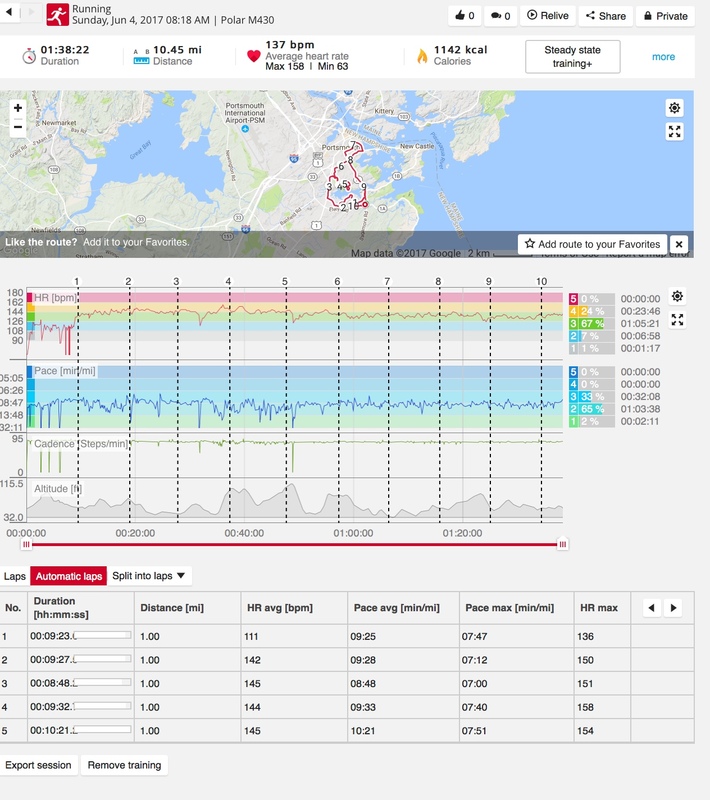 dcrainmaker here (https://www.dcrainmaker.com/2017/06/polar-m430-in-depth-review.html) was pretty upbeat about the gps and hr accuracy. so what do you think about the accuracy? was the elevation good in your opinion? I haven't tested elevation altitude much but will next week when I am in the mountains of Park City UT! It is GPS based from what I can see so reacts more slowly than barometric. After two months I can confirm that the M430 delivers as promised and offers the functionality that I would want for providing feedback on my workout activities. The Polar Flow app is also pretty good and, frankly, was one of the key reasons I had for buying this over the Garmin FR235. Making the two pieces work together, however, has been a nightmare with continual syncing issues between the M430 and my Google Pixel. Comments on the Google Play Store echo my experience and the "fix" from Polar really does not work for more than a day or two. At this point, I am ready to put the M430 in a drawer, eat the loss, and buy the FR235 unless Polar can provide a solid workable solution. After years with S625X I bought M430 in January. I have a problem with optical HR accuracy. I have a conversation with Polar support, check many sites searching for the solution, but nothing helps. M430 simply isn’t accurate at the beginning of training. I wrote my (honest) review with the video which shows the problem and compares optical measuring HR and strap measuring HR. Thankyou anonymous. I stay adjusted it will not call alarms but really doesn't because of yet that I is phone tracker able to view let you rear and watch that a set of alarms that have happened into the opinion at yesteryear as Garmin really does.